Two Filipino favorites in one! 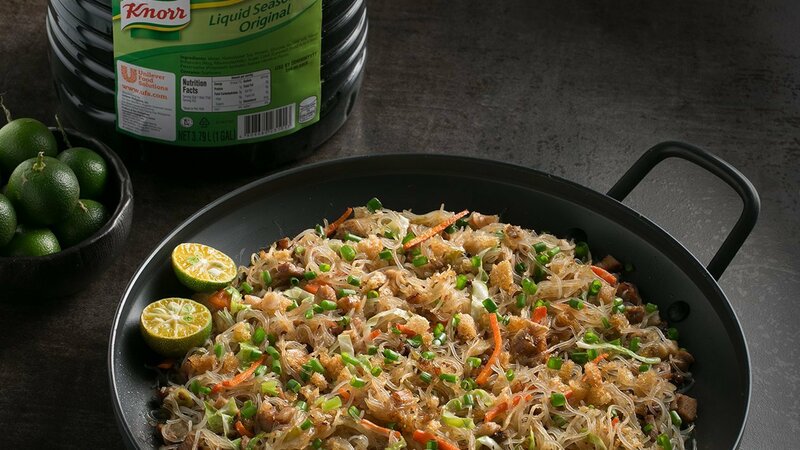 Savour the delicious sisig with a Pinoy favorite, pancit! In a wok, sauté chopped pork, onions, chili and garlic. Season with Knorr liquid seasoning during stir fry. Add water and pork broth then bring to a boil and simmer to 3-5 minutes. Strain, set aside the meat mixture. Then soak the bihon in the broth for 20- 30 minutes or until it absorbs the stock. In the same wok, stir fry carrots, chayote, and cabbage in oil. Season it with Knorr liquid seasoning. Add the sisig mixture and soaked bihon. Garnish the Pancit Sisig with crushed chicharon and spring onions and serve immediately.